(UUNN HQ) Prof. Athena ShaiDen has announced a plan to do a comprehensive scan of Amananth station. The effort will begin at 15:00 UTC on Saturday 116.3.5. Prof. ShaiDen recently took a sabbatical from her position at Sutonia University. When asked about whether this mission is connected to her sabbatical, she declined comment. The Board of Trustees of the Sarath V. Memorial Library have moved to re-open the Storyteller Contest, that was first announced during last year’s Festival! holiday. To enter, submit your own original story about jump-space. It can be serious or humorous. It can be standalone or part of a planned serial. Submissions should be at least 4,000 words. Each submission will be read and judged — and one entry will be selected as the winner. All submitted stories will be added to the Sarath V Memorial Library’s collection, and the winner of the Storyteller Contest will receive the Newtron Literary Award (“The Newt”). Submissions should be sent to librarian@tri-subspace.net and must be received by 116.3.31 to be considered for the award. (Sutonia, Amanra) Sutonia University has revealed that Professor Athena ShaiDen, the Chair of its Xenobiology Department, is going on sabbatical effective today. No details were released by the university and it is unclear why she has decided to take a sabbatical on such short notice. (GBS Station) Torn Danton has seen many things during his sixteen-year tenure as the owner and principal bartender at The SpaceBar pub in GBS Station, but these days all he sees is empty stools and red ink. (The Wake Station) The STCC today offered the services of Solrain engineers to help in the recovery and decryption of DSS found during a pilot-sponsored event in sector Canis 9501 in Amananth space. (UUNN HQ) A recently-retrieved DSS has yielded an entirely new kind of data — an image. As with other DSS, this one was made up on long strings of characters. In some cases, these are indecipherable … in other cases, once decrypted, they yield various types of information in text form. But a DSS-1 “Rare” found in Lesser Locks four months ago, turned out to be an image in encoded form. 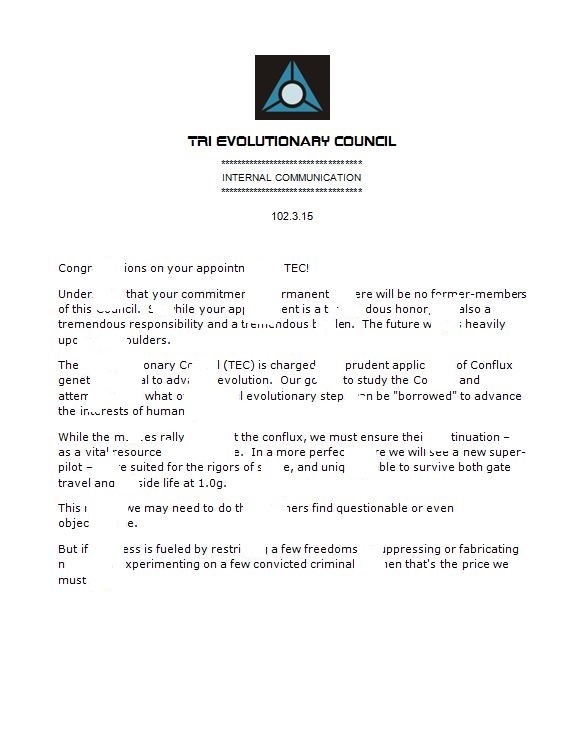 The document dated AT 102.3.15 appears to be an internal memo from the TRI Evolutionary Council (TEC) welcoming new members to its ranks. There is some data missing from corruption of the data, but some things are fairly clear: that becoming a member of the TEC was a lifetime commitment; that the TEC was involved with research that involved conflux genetics–not surprising since it was widely suspected that the TEC was the organization behind the Conflux Containment Center; and most shockingly, that the TEC supported human experimentation and denial of freedoms. In 102AT, the TEC was tied to the attempted assassination of Dr. Holly Q’son and the disappearance of TRINN Reporter Zoe Vexel … among many other things rumored but never substantiated such as the attempted assassination Dr. Nevin Yrral (then Director of TRI Research) and the successful assassination of Zhilaa Katdinal (then Director of TRI Bureau of Stellar Cartography). While the TEC was a part of TRI during The Reconstruction period, it was not part of the reorganization into TRI Corporation in 105AT. There has never been any information on the TEC membership roster. It is time to shed some light on Amananth’s secrets. Data discs are a start, but a good close examination of that station may give us some clues as well.